BeenThere-DoneThat: The Uffington White Horse, Oxfordshire. The Village of Uffington, Oxfordshire. 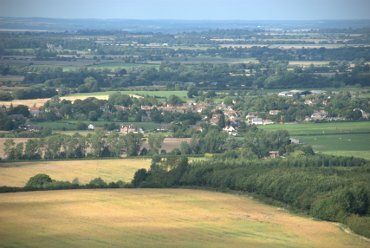 A lot of people will have heard of the Uffington White Horse and this is the village of Uffington from whence the horse gets it's name. This view is from the top of White Horse Hill nearby looking north across the Vale of White Horse. The nearest town is Wantage a little over 5 miles to the east. There is a fairly large National Trust car park, free to members, on White Horse Hill although it can be very busy at times. 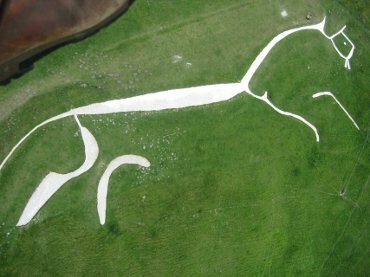 The Vale of White Horse, Uffington and Wantage all used to be in Berkshire but are now in Oxfordshire. They haven't been moved but the county boundaries have been changed by a meddlesome government. 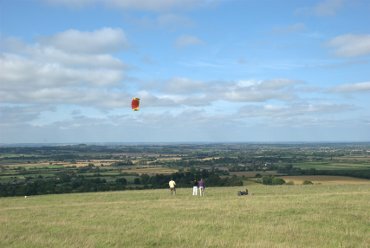 White Horse Hill is very popular on a sunny summer weekend and one of the pastimes that visitors to the hill seem to indulge in is flying kites. There were a number of such kites being flown when we were there and the wide ranging views are really quite something too. 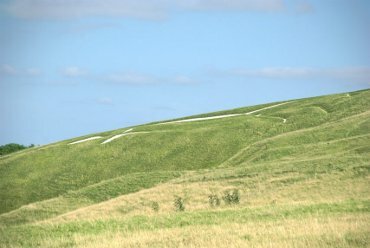 The white horse which gives its name to so many locations around here is carved into the turf of White Horse Hill showing the white chalk bedrock underneath. Rear legs on the left, front legs and head on the right. The head is mostly out of view with the nose just visible on the horizon a little to the left of the right-hand edge of the picture. The interesting aspect of this carved figure is that it cannot be seen in its entirety from any landward viewpoint as though it was intended to be seen properly only from the air. The White Horse, Uffington, Oxfordshire. Here the carving can be seen from the air with much greater clarity than from the ground. It is thought to date from the Bronze age at around 3000 years old.